Discussion in 'Current News & Events' started by tulc, Dec 12, 2018. Trump administration officials apparently are prepared to go to their graves insisting that they did everything possible to protect Americans with preexisting medical conditions, even as they pull out the stops to undermine those protections. The latest example of this subterfuge came in late October, when the Centers for Medicare and Medicaid Services (CMS) issued new rules for states contemplating alterations in the Affordable Care Act. Unfortunately, according to an analysis by Jennifer Tolbert and Karen Pollitz of the Kaiser Family Foundation, the administration’s proposals could do just that. “They seem to be aiming to lay out a path for state officials who are interested in undermining the ACA,” Pollitz told me. The CMS, a part of the Department of Health and Human Services, is responsible for overseeing compliance with the act. Its guide applied to waiver applications under Section 1332 of the act. That section allows states to propose limited changes in Affordable Care Act rules; before approving the waivers, CMS has to find that they don’t disproportionately harm patients with costly conditions, among other restrictions. The Trump guidelines loosen some of those restrictions materially. Let’s see how. Nothing this man does is surprising. Many say that he's "God's man." If that's so, then it's so because God is using him to show us how evil we have become. Should healthcare even be the government's business? Even if it is going to be should it be the federal government business as opposed to a lower level? That’s up to we the people and what we want. Polling shows a majority of Americans do want the government to be involved, since otherwise our health and access to healthcare is at the mercy of some people’s greed. I believe we should pool our resources for healthcare like we do for the military and fire department. It’s so much cheaper that way. I agree. Comments made about the cost of government provided healthcare are mostly lies. The money we pay now for health insurance won't keep going to various insurance companies when we shift to a single pay system, but numbers are calculated as though we're paying for two systems so the numbers are inflated. My former endocrinologist made $450,000 in incentives from pharmaceutical companies for an 18 month period. (Look up doctors at the Dollars For Docs web site.) These were paid to him from pharmaceutical companies. He gets paid to write prescriptions and promote certain medications. This is another thing that inflates the cost of medical care. There's a lot of unethical practices in the medical industry which make some people rich while the majority are paying for it. The hands-off approach has allowed this to happen. Investigate what your members of Congress for your area get in donations from medical and/or pharmaceutical companies. They don't want this to change so they feed us a bunch of nonsense to scare us. Lots of folk don't want to pay for healthcare for others since they may not have a sickness or ailment at this time in their lives. 80% of my property tax bills goes toward the public school system. I have no children in public school so why should I pay for that? If I'm in a traffic accident and the other person does not have insurance I'm sure glad I have insurance or I'd be out of a lot of money or possibly be in debt for the next twenty years after a judge gets finished with me. Great examples! Let’s face it, human beings are interconnected and to a certain extent, a health problem for one person or the lack of educational opportunities affects us all. Humans have survived because we look out for each other, not by being just out for ourselves as individuals. To me, that is what the loaves and fishes were meant to teach us. When we share we all have more. I believe we should allow people to pool their resources if they so choose. In other words, if I know a particular person has a lot of medical bills or bills that otherwise are high and I choose to help put so be it, if not so be it. ( If you insist on having government healthcare then at least leave it how it is now where if someone chooses to both Medicare and the VA allow people to purchase additional plans if you are going to have government healthcare do it that way). If you are going to have government anything I feel that it should be like fire departments on the state or better yet local level closer to the people. Military is a little different because they are defending the whole country, but even education is handled either on the private level or local (usually city or county level. Yes, they have the state and federal department of education, but for the most part it is the local government that hires teachers/other staff has a fairly large say in what is taught (especially when it comes to courses that are not core subjects and to some extent determines graduation requirements and even determines if students outside a given district may attend their schools. The reason I mention education is because that is something that is required every state has public schools. It is not so much ( for me any now not wanting to pay because I do not have that particular thing at the time it is people being forced to pay for things that they either A do not agree should be covered and/or B will never need. First off, a politician has to answer politically, or they get destroyed by the public. The reality is, preexisting conditions should never be covered. That was a horrible policy that has tripled the cost of health care, or more. When you include both the total premium, plus the total increase in deductibles, we are vastly worse off after Obama-Care, than we were before. In 2006, I had a $1,000 deductible insurance plan, that cost me $67 a month. 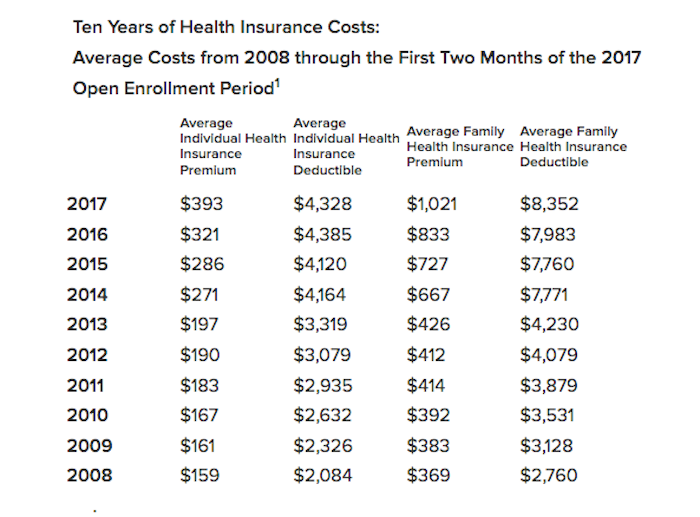 The cheapest plan you can find today, is almost $300 a month, with a $7,000 deductible. This is insane. Why did this happen? For a number of reasons, but one of the big ones, is the pre-existing conditions clauses being removed. Insurance, is a policy that covers unexpected loss. If you expect it.... it isn't insurance. By removing pre-existing condition clauses, you basically allow people to just not have insurance until they get sick, and then the companies must cover you. If the company has to cover you..... then everyone else has to pay for it. Insurance companies don't have magical piles of cash in the backyard to continuously pay for whatever it is you want. Whatever the company pays out, has to be compensated by charging the customer more. That means you have to pay a higher deductible, a higher premiums, to pay for everyone the company has to cover that already had an illness before they got insurance. The insurance company is going to make profit, or it won't be in business. So they are going to charge you enough to cover everyone who refused buy insurance until they had an illness.... and make a profit from it. Again, if they didn't, then they would go out of business, and you wouldn't have insurance. Pre-existing condition clauses are required in order to have affordable health care. That is simply how it is. What if instead people could change insurance if they had a pre-existing condition, BUT NOT get it if they did not have it at all or the policy had lapsed. In addition to not allowing companies to drop people once they had a condition ( even if it was one where relapse was possible or even likely. The reason so many Americans balk at the idea of paying for others' healthcare is because there is a fundamental American belief that "God has helped those who helped themselves." If you get sick, it's because you deserved it, and because you deserve it, nobody should mitigate your punishment." Americans will believe that of others even when they themselves are on Medicaid. And you have just wonderfully explained why insurance is a poor model for health care and should be abandoned. I have a young friend--I've spoken of her before--who was born with a brain tumor that is not completely removable. All her life, she has had to have brain surgery every three years or so to cut back the tumor or she'll be killed by it. When I first met her, she was nine-years-old and her head was still shaven from her most recent surgery. She's in her late 20s now. She will testify in a heartbeat that Obamacare was sent from God for her. It enabled her to have a way to afford her surgeries without being left destitute. It enabled her to become a missionary in South America, where a couple of years ago she learned the language of an obscure Indian tribe that did not even speak Spanish. She was the first person to take the gospel to them in their own language. And she does this while carrying a thing in her head that's constantly working to kill her. But in the last year, because of the Trump Administration's attacks on Obamacare, she has actually had to abandon her American citizenship to become a citizen of a country that will provide for her brain surgeries. So we go back to the days that if you have cancer or something else you get fired and then you have to get another job with insurance that will not cover your illness? In 1981 I got laid of work and my wife was pregnant with twins. My new job insurance would not touch the pregnancy or delivery; but WOULD pick up the girls when they were born. So how do people with preexisying conditions and aren’t rich get and keep health insurance? We all at some point will have a preexistibg condition. That is why medical costs used to be the number 1 cause of bankruptcy. First, we pay for other people’s healthcare no matter what. When uninsured people show up in the emergency room, they get care and the cost is simply passed on to us in the form of higher premiums due to higher fees from the hospital. Secondly, insurance is a form of pooling resources so you are alwYs going to be paying for other people and things you don’t want. If the cost your were paying for healthcare was cut in half I don’t think you would care so much that you were paying for things you don’t want. In the U.S. we pay twice as much for healthcare as other developed countries, and have worse health outcomes. I’m fine with state health care if it is required. Where I live we have excellent state health insurance (for poor and working class) and it’s so good people get upset when their income goes up and they get kicked off. so now she has lost her chance to be a citizen even if she wants to once you have renounced it as an adult you will never get it again. It should not be required, but people should understand if you choose not to have it do not expect to get treated when you need it (unless you come up with all the money yourself. and if we drop the preexisting conditions clause may be again OR people could do like I said and not expect to get treated if they opt not to have it and get sick. If being a citizen of the US means dying painfully with a brain tumor....Trump is going to be president for at least the next two years. She realizes her true citizenship is in Heaven. Where she is on earth is simply where the Lord has temporarily deployed her.